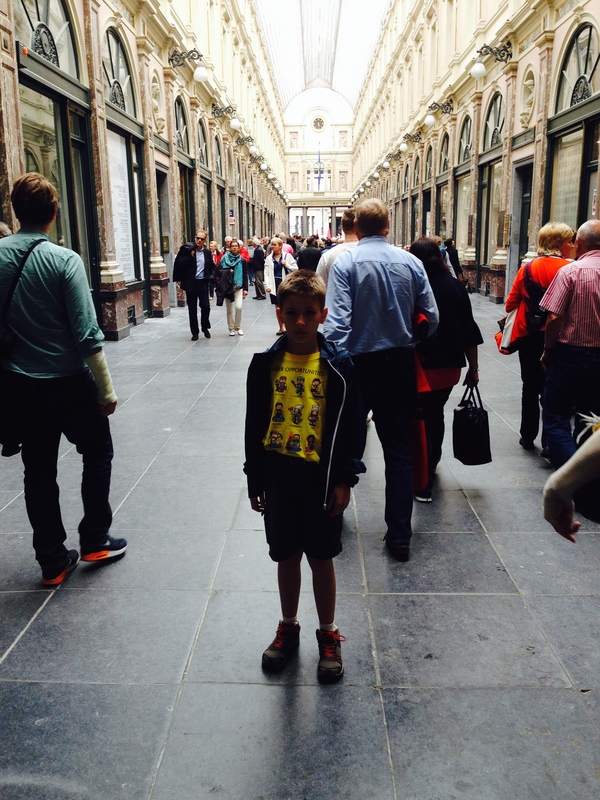 A Short Day in Brussels. Today is the Ascension of our Lord and we drove into Brussels, first to take my Meter (godmother) and Aunt to the airport so she could fly back to Bordeaux France where she lives. Then we drove into Brussels past the new NATO Headquarters being built across the road from the old headquarters. We passed the American and British embassies on the Rue Ducale then stopped at the Royal Palace where I had my photo taken by my dad. We then drove down to the Cathedral of St. Miacheal and St. Goedele where we attended high mass. The mass is said in both Flemish and French because Brussels is an official bi-lingual region of Belgium. 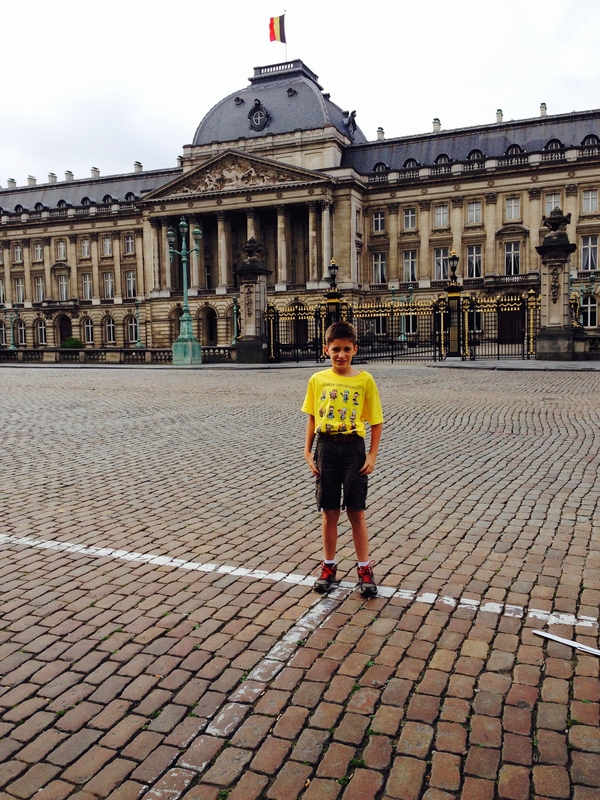 Me in front of the Belgian Royal Palace. The flag flying means the King is home. 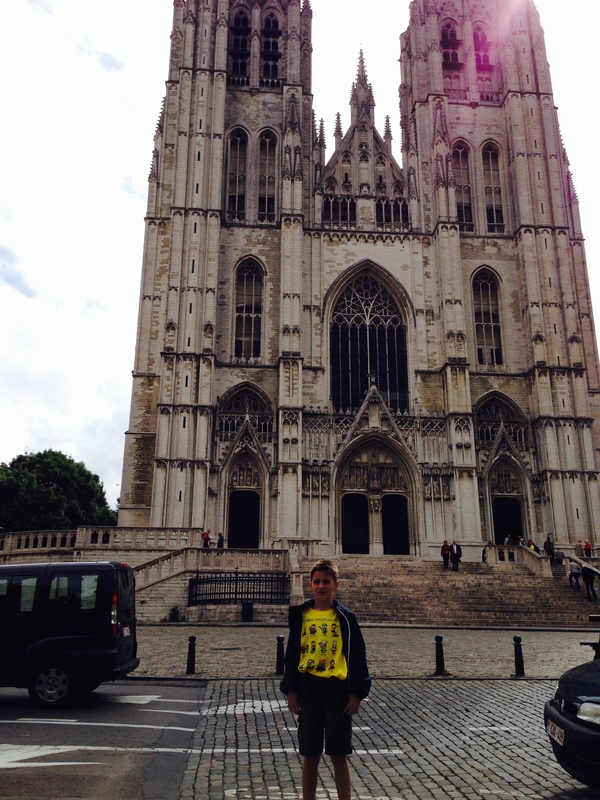 Me in front of St. Michael and St. Gudulale Cathredral in Brussels. 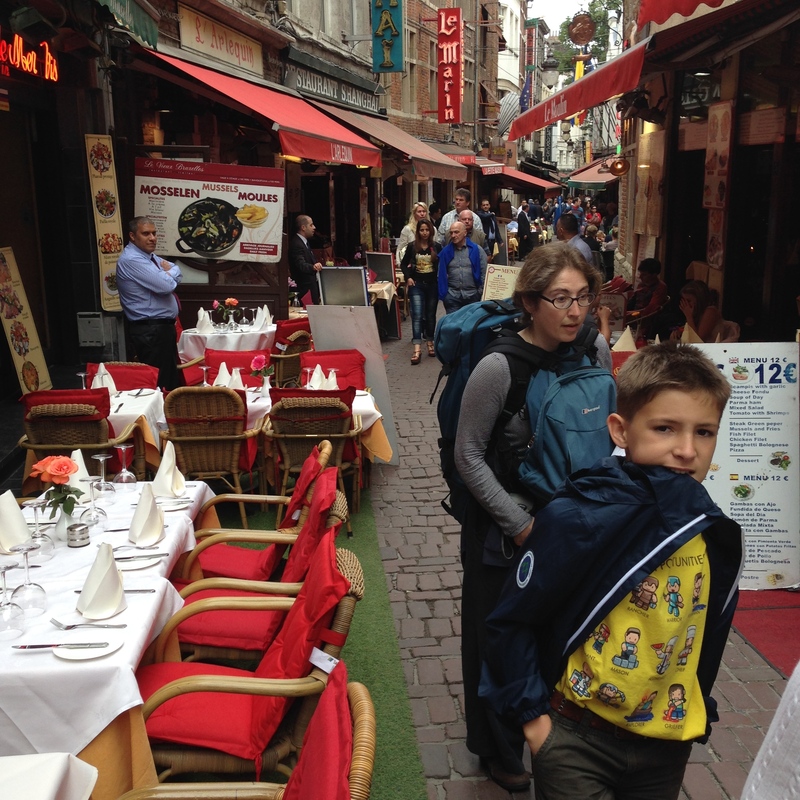 After mass we walked down to the Grand Place/Grote Markt where we had lunch at La Chaloupe d’Or. I had a croque monsiuer (grilled ham and cheese). My dad, who is searching for the best Steak Tartar thinks he found the winner at this restaurant. It is in the building that used to be the guildhouse for the tailor’s of Brussels. 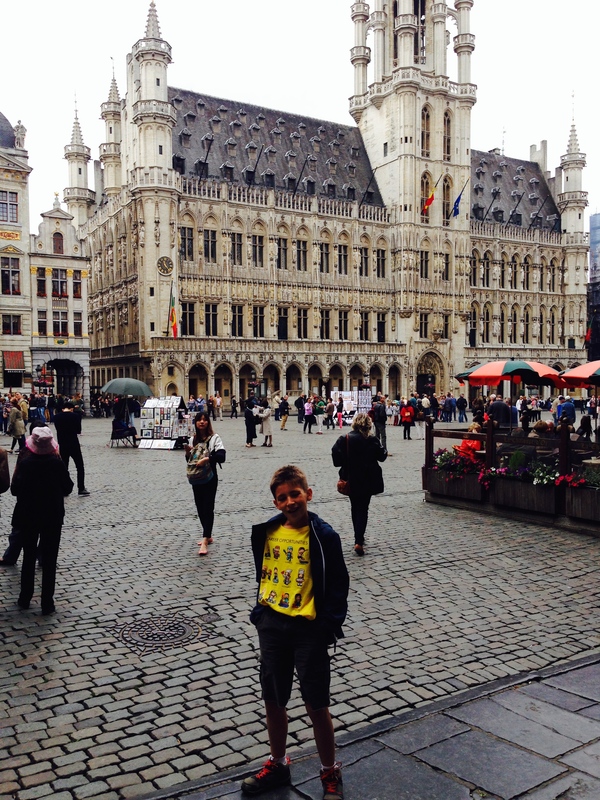 Me in the Grand Place/Grote Markt, the main square of Brussels. 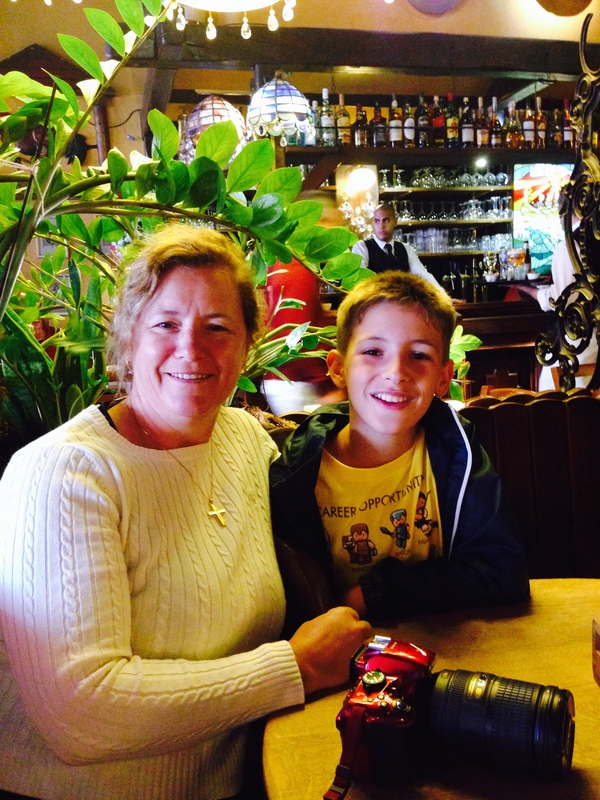 My Mom and I at our table in La Chaloupe d’Or on the Grand Place for lunch. After lunch we walked down this small street full of people to see the famous Mannenkepis (Litte Boy who Pees). 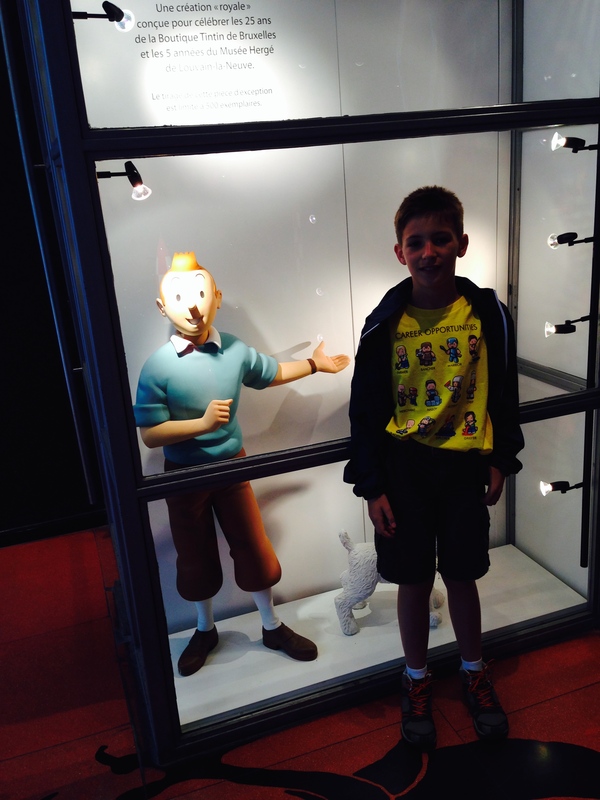 On the way we stopped in the Tintin shop where my dad took this picture of me with Tintin. At the Mannenkepis there were hundreds of people and we had to really work our way through to get this photo. The Mannenke was wearing a black “cavalier’s” uniform probably of some society or guild celebrating that day. 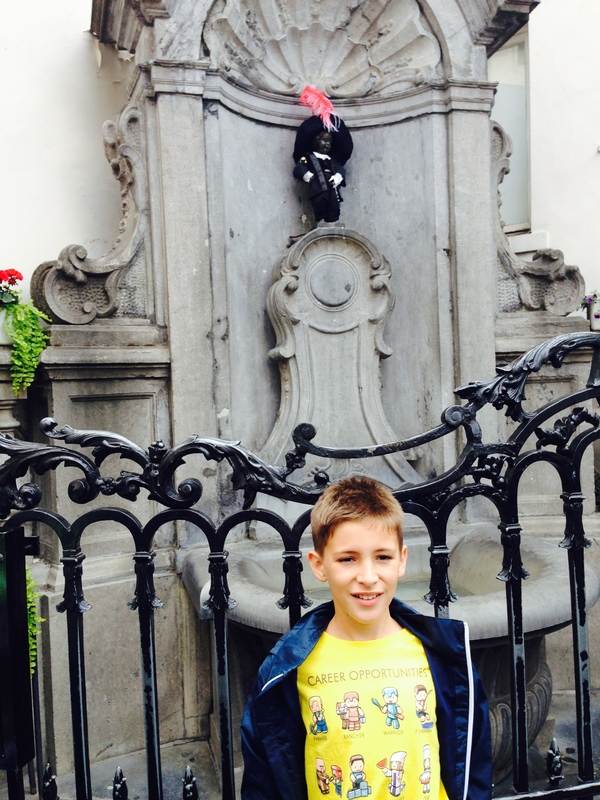 I am in front of the famous Mannenkepis and he is wearing a special uniform today. 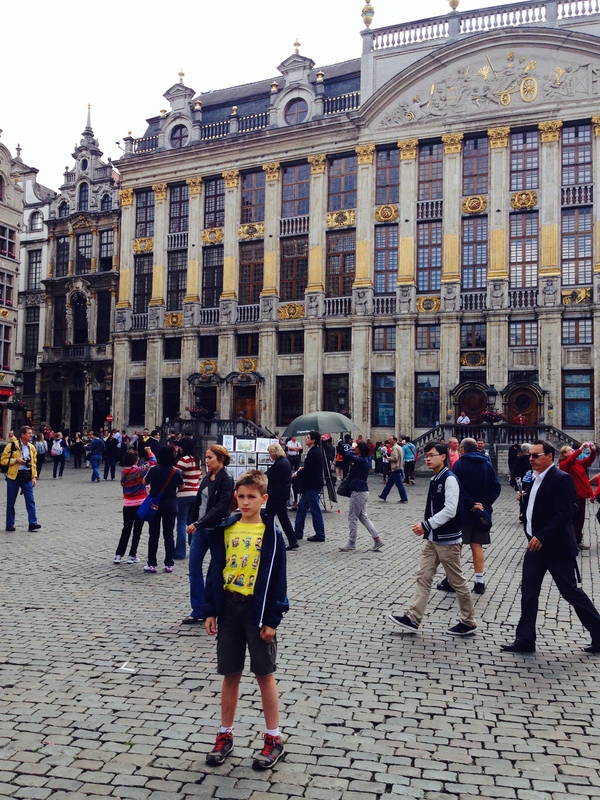 We walked back to the square and my dad took a photo of me in front of the building in which my Papie had his offices. It is another old guild building. 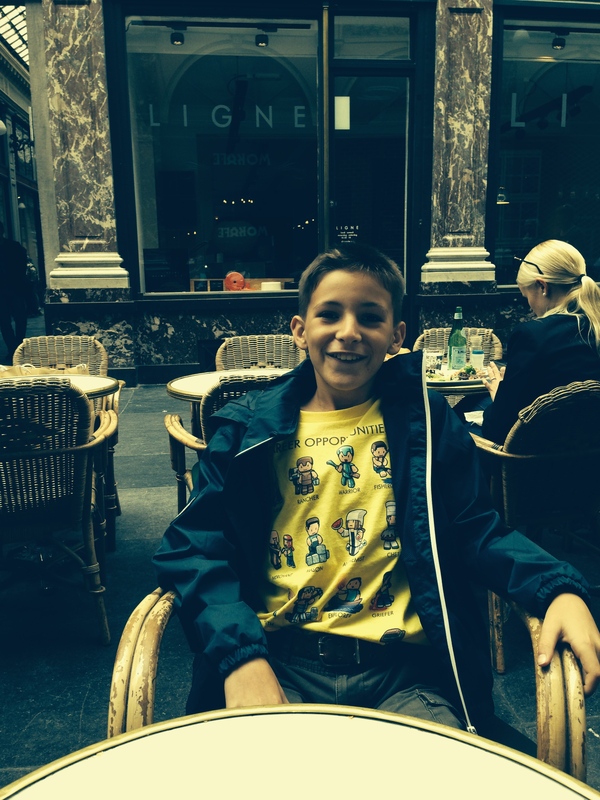 I am in front of my Papie’s office’s on the Grand Place in the building in the background. We then walked over to the alley’s that have all the little restaurants. Walking through Alleé Boucher with all the restaurants. It is called the Rue Boucher which leads up to the Galarié Royale St. Hubert where we stopped for coffee and Dame Blanches’ or what you and I would call “hot fudge sundaes”. Me in the entrance to Galarié St. Hubert off the Rue Boucher in Brussels. I am at the Moven Pîck at the Galarié St. Hubert ready for my Dame Blanche. We left then for the car which was parked next to the Cathedral. 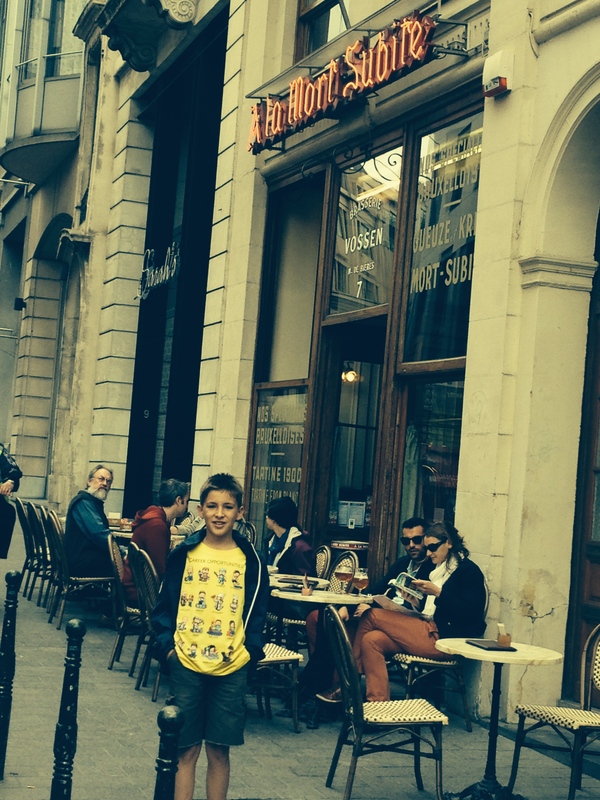 We passed by a famous tavern called Á La Mort Subite or Sudden Death which is named after a famous Belgian beer. Me in front of Le Mort Subite or Sudden Death named after a famous Belgian beer. This is Frederick and I am going to tell you tomorrow about our drive by of the Atominium at the old World Fair site but now I am going to play with my iPad mini. ← The Belgium Red Devils!